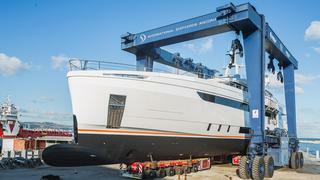 The Wider 150 superyacht has been undergoing sea trials to test her innovative diesel-electric power system. 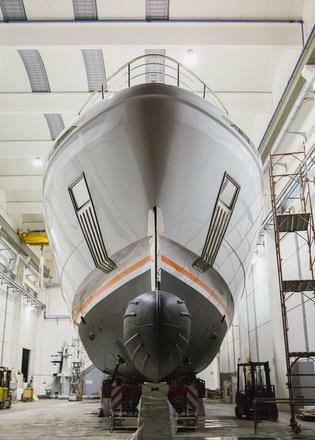 This news follows the much-anticipated launch of Wider's first-ever superyacht in October, when the 46 metre was christened and lowered into the water. The Wider 150 has lithium polymer battery banks that not only supply the entire hotel system but also hold enough power to run the yacht exclusively on her batteries. The yard has spent several days testing this system off the coast of Ancona, Italy. 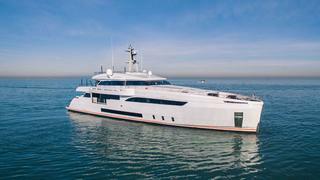 The aluminium motor yacht features interior and exterior design by Fulvio De Simoni, as well as design input from Wider president Tilli Antonelli and his team of designers and engineers. The Wider 150’s main and upper deck lounges have floor to ceiling windows, letting the light flow in. A sliding door on the upper deck skylounge and dining area creates an indoor/outdoor living space, while the main deck comprises a main saloon and a separate formal dining area. The elegant interior décor includes leather by Poltrona Frau. Another wow-worthy space on board the Wider 150 is the 75 square metre full-beam owner’s cabin. This is separated by sliding doors to an office and study. The suite has a walk-in closet, bathroom with bespoke wooden bathtub and a 5.6 square metre sea terrace. Four further guest cabins provide accommodation for up to 10 guests, while four crew cabins and a captain’s cabin will sleep nine crew members. 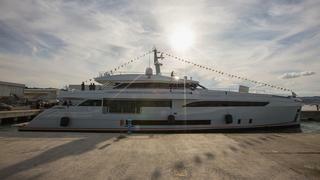 The beach club on the newly launched Wider 150 is notable, hosting a seven metre seawater filled swimming pool. The stern area can also convert to a garage that stows the Wider 32 tender, one of the world's fastest superyacht tenders. Other intriguing outdoor spaces on the new yacht include the concealed foredeck lounge – a watertight hatch raises to reveal a hidden lounge area with a table for al fresco dining and even a TV, making this an amazing outdoor superyacht cinema. The sun deck is also primed for entertaining with a barbecue, bar and spa tub. The Wider 150 has a unique engine room layout with her technical spaces divided into two areas. There is a power generator room in the bow and a technical room in the stern, which hosts the lithium polymer battery pack. This layout is designed to leave more space in the midsection of the yacht for guest accommodations. The Wider 150 will use a hybrid diesel/electric propulsion system, allowing the owner to significantly reduce fuel consumption at low speeds. The Wider 150 can cruise in zero emission mode using only the battery packs, or with the four inline generators, making her one of the yachts proving that silence is the ultimate luxury.